Some type of fern exists in all of Earth’s continents and climate zones except the Antarctic. We often think of the ferns that grow along creeks in damp, shady areas, but some ferns are adapted to hot, dry desert environments. Some ferns are tiny, such as aquatic ferns with a height of less than 1 inch, while some tree ferns can grow to nearly 75 feet high. More than 10,000 species of ferns are known to exist, according to the New York Botanical Garden. Even more existed long ago in the Carboniferous era, which occurred 369 to 280 million years ago, making ferns some of the oldest plants on earth. A majority of ferns live in damp tropical regions. Although ferns are classified as vascular plants, they do not form flowers but rather reproduce by means of spores that usually grow in the undersides of the fronds (leaves). Ferns differ greatly from other plants that are classified vascular. Most vascular plants move nutrients and water up by means of specialized tissues. The parts of fern plants have been given different names to the corresponding parts of other vascular plants. For example, instead of a “stem,” a fern plant has “rhizomes.” Instead of growing upright, like the stems of other vascular plants, the fern’s rhizome grows beneath the soil surface, or barely covered by soil. In some ferns, the rhizome can grow erect: the growing habit of such rhizomes is called “caudex.” Just as the stems of other plants transport nutrients and water to the plant, the rhizome performs the same function. Spores in ferns are similar to seeds in other vascular plants. Spores grow in bundles, which are referred to as “sori,” and grow underneath the fronds. Plants such as ferns that reproduce through spores instead of seeds are known as lower vascular plants. Two types of fronds exist on fern plants: larger (megaphylls) and smaller (microphylls). Megaphylls have an elaborate vascular system and microphylls have only one poorly developed vascular vein. Fronds make up the largest part the fern plant above the soil surface. They have two sections: the stipe is the stalk and the lamina is the leafy part that grows outward from the central vein. 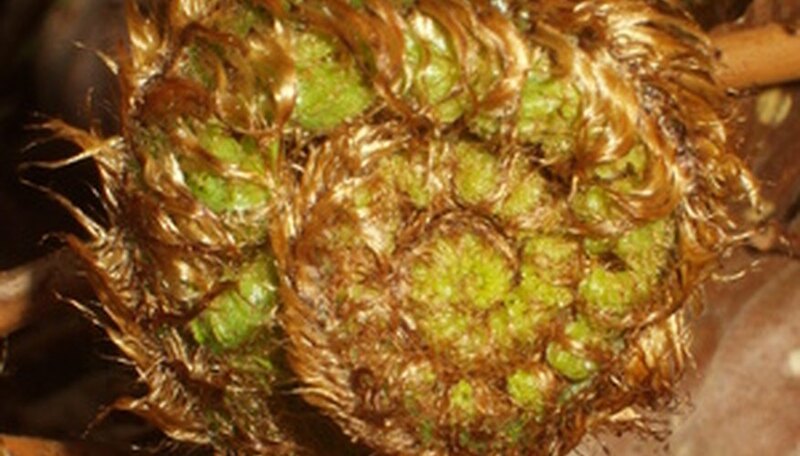 Many ferns grow new fronds by sending up curled “fiddleheads,” or “croziers” that will unfurl and result in fresh growth. One type of fern, the grape fern, does not develop fiddleheads, which makes it hard to identify and distinguish, according to the New York Botanical Garden. Fiddleheads are generally covered with downy hairs, which protect the plant from insects, fungi and other organisms. Some fern fiddleheads are gourmet delicacies; in Hawaii, fiddleheads from the bracken or vegetable fern are known as warabi and are commonly pickled or cooked in Asian dishes.